The wfscom.xml file and directory in which it is located might not be visible by default. To see this directory, open Windows Explorer. On the Tools menu, click Folder options. Click the View tab. Select Show hidden files, folders, and drives, and click OK. 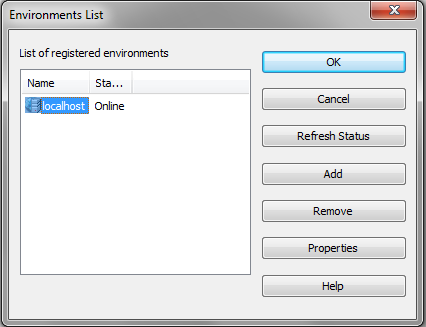 The Environments List dialog box opens, as shown in the following image. This dialog box lists all WebFOCUS environments that are defined for App Studio. You can also access the WebFOCUS Environment Properties dialog box using by right-clicking on the Configured Environments node and using the shortcut menu to click Add. At the top of the dialog box is the Description field, followed by the Environments Settings area. The Environments Settings area contains a series of buttons that represent components in a WebFOCUS environment and the required parameter fields to configure that environment. When you configure an environment, the areas below the buttons can change according to the parameters that are required. Note: The description cannot contain special characters, such as., /, \,?, *, and others. A message with characters not allowed appears if one of the restricted characters is detected during validation. For some environments, once you specify the web server, all other settings default. If the WebFOCUS environment you are accessing does not use default settings, or the components require authentication, click the appropriate button in the Environment Settings area to provide the parameters. The parameters available for each component are explained in the following sections. Note: WebFOCUS environment properties must be supplied in a specific order. For example, if web server security is enabled, you cannot set the WebFOCUS Client name until you have provided valid web server credentials. Similarly, you cannot retrieve a list of Reporting Servers until you have provided a valid WebFOCUS Client Path. The WebFOCUS Logon dialog box opens and prompts you for a WebFOCUS ID and password, as shown in the following image. Type a user name and password, and then click Logon. The WebFOCUS Environment Properties dialog box closes. The following image shows the WebFOCUS Environment Caching area of the WebFOCUS Environment Properties dialog box. The file content caching location path, shown in the following image, is for a Windows 7 machine. Caching increases the App Studio performance speed, because remote machines are not accessed and queried every time you request information. This is especially useful when accessing mainframes or when a network connection is slow. Note: Caching should not be used when multiple developers are working with the same files because they could overwrite changes made by other developers. By default, caching is not enabled. Cache remote directory and file information. This option caches information about files stored in the WebFOCUS environment. This does not actually cache files, only information about them. If you select this property, App Studio does not query the Reporting Server every time it needs a list of files stored in the WebFOCUS environment. If you do not know your Client Path, ask your WebFOCUS Administrator or check the WebFOCUS Administration Console of the environment to which you want to connect. The Client Path settings for the environment are located under Utilities and Client Selection. Use Default. Specifies that the default HTML alias is used. Keep this option selected unless you change the HTML Alias value. If the Client Path field is empty, and the Use Default check box is selected, there may a problem connecting to the WebFOCUS Client. Ensure your web server is started and that you typed the correct properties on the Web Components page. If you still cannot connect, contact your WebFOCUS Administrator. Connection Timeout. The default time to connect to a WebFOCUS environment is 60 seconds. However, in some systems, this needs to be increased to avoid connection failures when the timeout period is reached. If timeout issues are experienced, increase this to 240 or higher. Also, increasing the timeout can address issues with slow environments or environments that have many resources (applications or files) during development. Web Component Authentication. Used when authentication is required on the web server. To set security, select the security method that matches your system from the drop-down list. A web server ID, password, and other settings may be required or enabled, depending on the security method that you select. By default, this option is set to None, which means that the web server must allow anonymous access. You are prompted to sign in to WebFOCUS to verify your configuration. You are also prompted to sign in to WebFOCUS if you click OK to exit the dialog box. When the correct WebFOCUS Client Path is provided, you can specify properties for the remaining components. The following image shows the Data Servers area of the WebFOCUS Environment Properties dialog box. Note: Managed Reporting is not enabled in WebFOCUS Version 8.